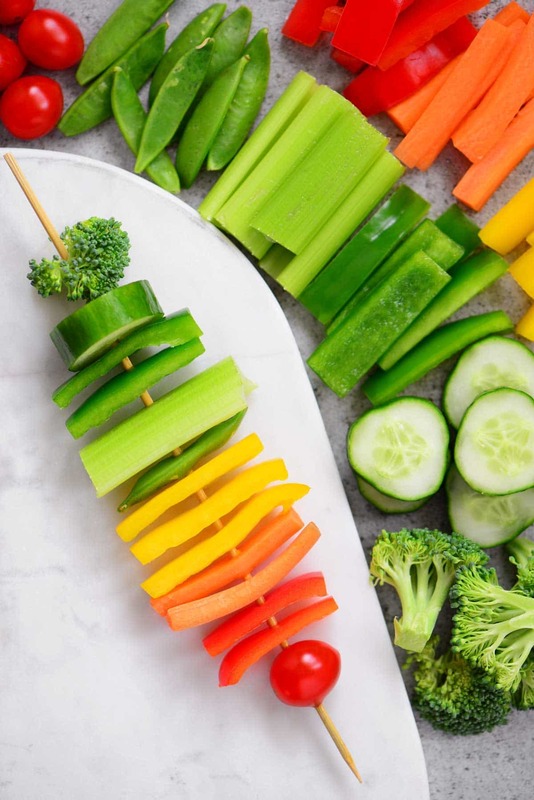 These Rainbow Veggie Kabobs have a bright rainbow of colors on a stick and can be served at any occasion from last-minute get-togethers to planned parties. Sponsored by Marzetti® Veggie Dips. Whether or not you are the New Year’s resolution kind of person, most people make a commitment to eat healthier foods after all of the holiday feasting. There are so many ways to add more fruits and vegetables to your meals. I’ve been getting fruit in my morning smoothie, veggies in my soup for lunch and more veggies in a side dish for dinner. But what about when you get together with friends or family? Quite often there are snacks and desserts involved. So, why not bring a veggie tray to ofter a healthy choice to go along with the rest. 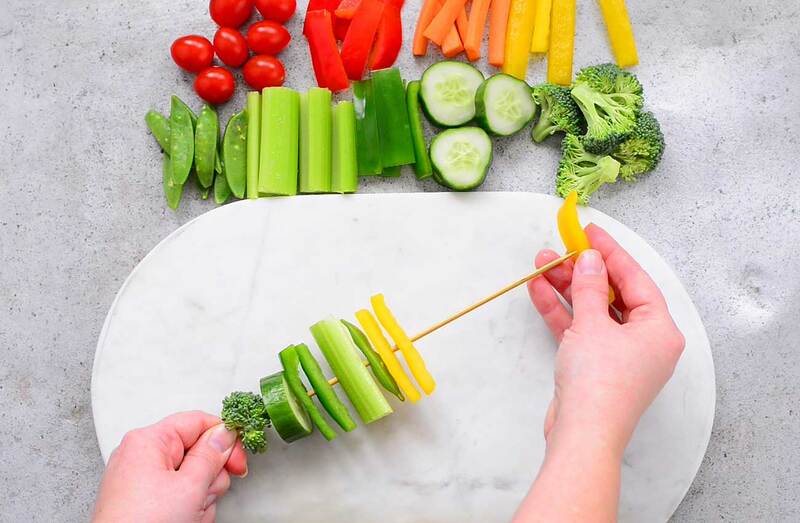 These Rainbow Veggie Kabobs are an easy, fun way to grab fresh veggies. Serve them on a tray with a couple of Marzetti® Veggie Dips. Wash the vegetables and cut them into strips, slices, wedges, and florets. 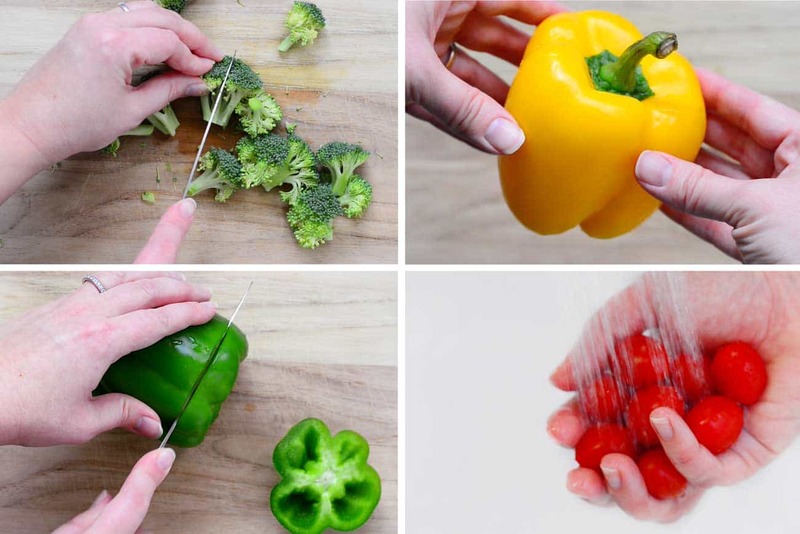 When cutting the denser veggies like carrots, make sure you cut them into thin strips. 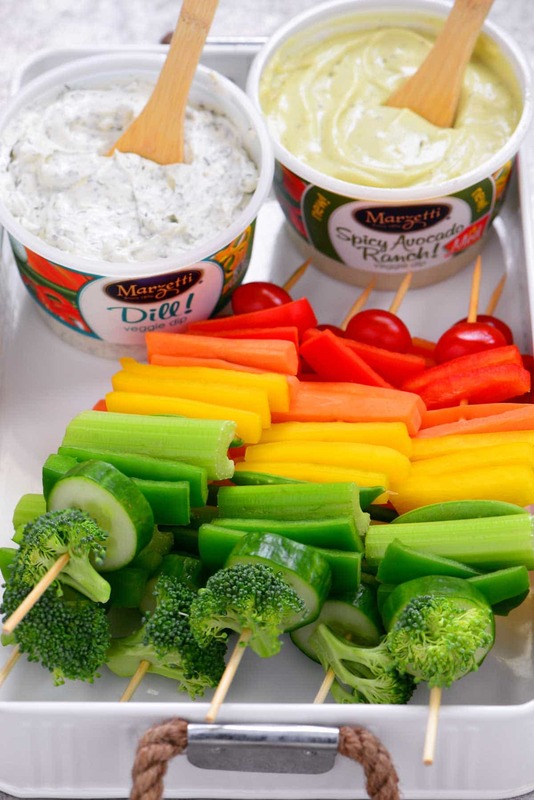 Stack the rainbow veggie kabobs on a platter and add a couple of containers of Marzetti® Veggie Dip. 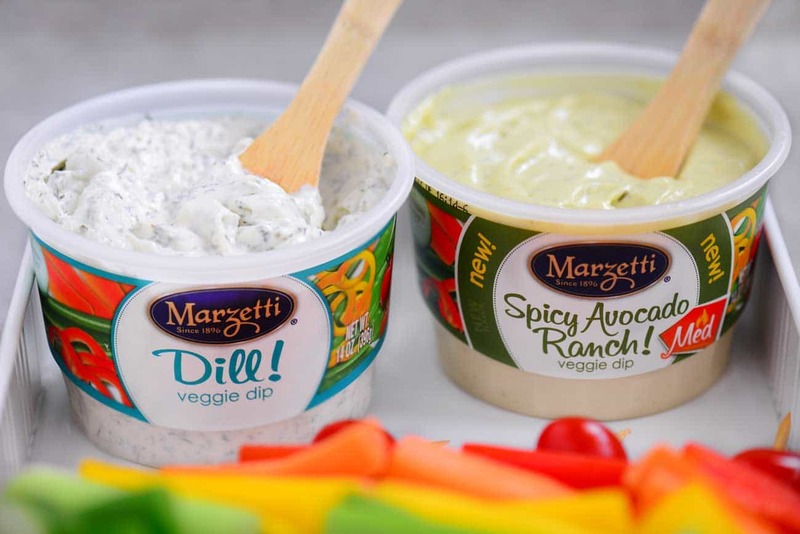 I love all of the varieties so it was hard to decide but this time I chose Marzetti® Dill and Marzetti® Spicy Avocado Ranch. Put a small serving spoon in each container of dip before serving. These Rainbow Veggie Kabobs can be served at any occasion from casual get-togethers to planned birthday parties. The bright rainbow of colors on a stick makes them feel as good as finger foods and helps everyone stick to their New Year’s resolutions. You can enter below for a chance to win a $50 Visa Gift Card to buy the ingredients to make you own Rainbow Veggie Kabobs Tray with Marzetti® Veggie Dip to share with your family and friends. I would share it at our office pot luck. i would share this at our upcoming camp fire meeting! the kids really enjoy a healthy snack. I love veggie trays. I can’t wait to have ours this weekend while watching the Super Bowl. We’re making one for Super Bowl Sunday! Dips are always a staple during our game days or outdoor cookouts. I especially like their caramel dip with sliced fruits. Veggie trays are perfect for our family get togethers we have every month! Sunday at our super bowl party would be a great time!